Start using these 10 Google Analytics dashboards instantly and analyze your data with the same metrics that top agencies and consultants use. Since we created our Template Library in April 2017, thousands of visitors have downloaded 1-click dashboards from one of our 50+ integrations. Google Analytics covers so many different marketing and analytics metrics. For example, if you are a content marketer that wants to improve your SEO skills, you can use GA data to dig into site performance data and optimize load times. There always seems to be something new that you need to learn within GA if you want to make more data-driven marketing decisions. So, even intermediate-level GA users may still need templates to explore new parts of the service. Google partially addressed this issue by creating the Solutions Gallery, a showcase where marketers and analysts can share the dashboards, reports and segments they use. However, these sharable dashboards only cover Google Analytics data. And, they do not include any explanation of how to actually use them to make marketing decisions! Marketers must figure it out themselves. So, we duplicated the 10 most popular dashboards, which have been downloaded hundreds of thousands of times, into Databox. Now, we can give you full explanations on how to use them, and how to combine them with other data sources to make more informed decisions. 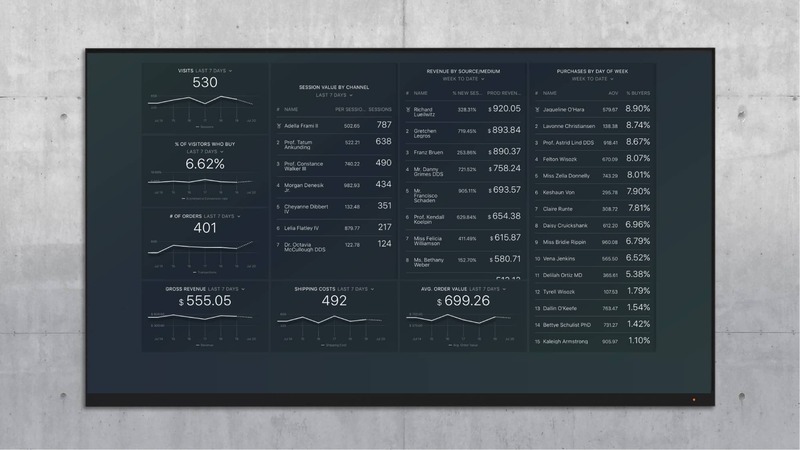 These 10 dashboards cover every part of digital marketing. And, they were originally shared by Google Analytics experts and top SEO, PPC and content-focused agencies. Problem It Solves: This dashboard will show you which types of visitors are digging deeper into your site. By focusing on both sessions and bounce rate, you can get a good idea on which sources bring quality visitors. You do not want to simply look at traffic metrics like sessions because you will not get any insight into where you need to prioritize marketing efforts. You will only learn whether people are finding your site. How To Use It: This dashboard should kick off a further investigation into one of three areas: mobile, social or referral traffic. Look at bounce rate across referral traffic to determine what types of visitors need your product. Use the mobile combo graph to see if your site is attracting more or less qualified visitors as it grows. Are mobile visitors sticking with your site? Which sites refer the most traffic to your domain? Which social networks create quality visitors? Combine It With: If you are looking at social and referral traffic, you probably want to use Google Search Console to investigate organic traffic as well. Problem It Solves: This dashboard gives you all the key stats on the types of visitors that arrive at your site. By focusing on demographics, devices and locations, you get a full picture of your visitor’s context for learning about your product. How To Use It: Before you can decide if you are converting visitors to specific goals, you need to have quality traffic in the first place. For example, if you have a high percentage of mobile visitors, you may need to lower expectations for product sign-ups or demo bookings. If you have visitors from countries outside your target market, you may need to rethink your marketing strategy. If you have the wrong demographics on the site, you should investigate how those visitors heard about your site in the first place. What are your visitors’ favorite mobile devices? Combine It With: Since this dashboard focuses on acquisition, you may also want to use a tool like Hotjar to view your visitors’ activity on the site. Problem It Solves: If you want to prioritize your organic search ranking efforts, you need to know which existing pages lead to quality visitors. 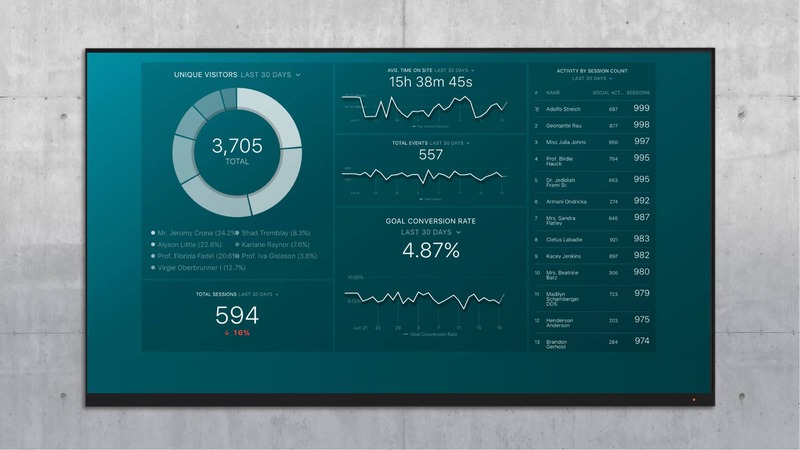 This dashboard examines the entire process, from search query to page to goal completion. It tells you which organic search terms drive quality traffic. How To Use It: Look for trends across all queries, organic clicks and goal completions. For example, let’s say that you sell CRM software for real estate professionals. You consistently see positive activity around blog posts on prospecting advice. This is a cue to develop more content on the subject so you can rank even higher, and bring in more quality visitors. Which landing pages create quality organic visitors? What pages lead visitors into your site? Which search queries lead to clicks? Which landing pages need improvement? Problem It Solves: Avinash Kaushik outlines three major types of metrics you can measure in Google Analytics: Acquisition, Behavior and Outcomes. Most organizations do a poor job of linking the three together because they send separate teams to work on each one. So each team is incentivized differently! This dashboard is also called the “VP Social Media Performance Dashboard“. Let’s say an executive tasks you with “getting more social media traffic”. Instead, you want to return to them with a full picture of the actions that visitors from social media sources take on your sits. How To Use It: In the left column, use visitor metrics to determine which social media networks bring the most visitors. You probably don’t have time for all of them. Use the social actions v. sessions metrics to whether your site creates loyal visitors that will later share your work on social media. Use Goal Conversion Rate and Events to determine whether visitors later sign up for your product or make a purchase. This is an “Outcome” metric. What are the most common sources of traffic? How well am I converting visitors? How long do visitors spend on my site? How many visitors return for multiple sessions? Combine It With: Any of the 4 major social media networks. You can use analytics from these platforms to see if those social shares actually build your audience. Problem It Solves: You have hopefully dedicated significant resources to a strong user experience on every device. 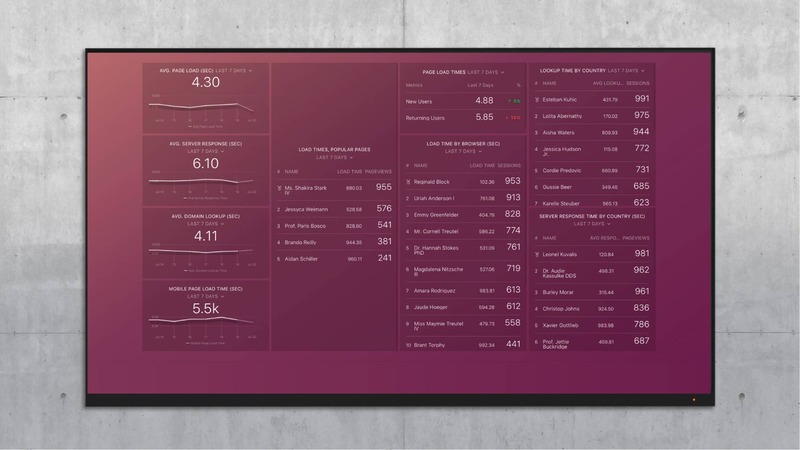 This dashboard tells you where you are doing a great job, and where you need to focus more effort. It starts with sessions/bounce rate as acquisition metrics, but then uses Events to determine if visitors are actually watching videos, filling out forms and taking other key actions that you want to monitor. Should you look for different conversion points on mobile and tablet? For example, OverGo Studio completely changed their client’s site experience on mobile and saw 30% more calls to the business. Problem It Solves: Justin’s dashboard looks at both on-site and off-site social activities. In other words, you will learn which social channels bring quality traffic to the site (traffic that does not bounce). Once they arrive at your site, you learn whether they stick around to complete specific Goals that you have set up. Which social networks lead to visitors that actually complete goals? Which social networks create visitors that spend time on your site? Which networks generate return visitors? Which mobile devices generate quality visits? Combine It With: If you are use the inbound marketing funnel, you can take this a step further and combine it with HubSpot or Marketo to see if these visitors turn into leads and customers. 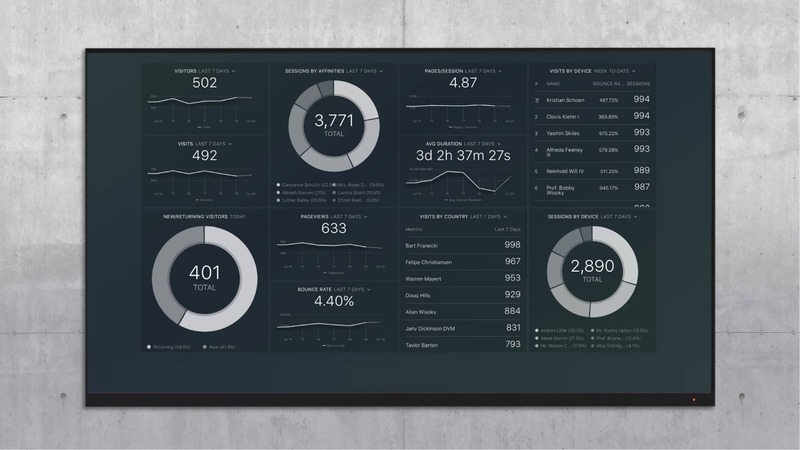 Problem It Solves: This dashboard looks at the efficiency of your content. In other words, how many sessions will you need to hit your monthly goals? If you acquire visitors that do not click into other pages and complete goals, you have a huge challenge ahead of you. How To Use It: Look at the pages with many exits and high bounce rates. Then review each of those pages and decide if you need a call-to-action or logical next step on each page. Also, look at landing pages with high conversion percentages and try to figure out what you need to do to bring more traffic to those pages. Which pages lead to goal completions? Which pages encourage visitors to read further? Which pages do new visitors hit first? Combine It With: If you focus on content marketing, you probably need to align this data with HubSpot or another conversion-oriented tool to make sure that quality visits translate to leads. Problem It Solves: There are many levers you can pull if you want to grow your e-commerce store. Whether you want to aim for larger orders, more profitable orders or more frequent orders, Google Analytics has a metric that you can track in real-time. 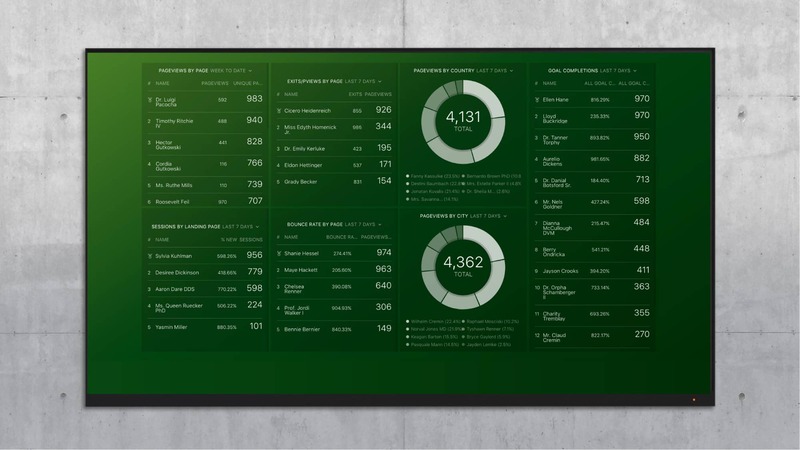 This dashboard captures all of them so you can zero in on which part of the store underperforms. How To Use It: Use the table with Session Value by Channel to determine where you should be looking for more traffic. Use the 6 line graphs to make sure the metrics that determine profit are stable. If one metric needs improvement, monitor its daily reaction to changes in the site or marketing. Which days of the week have the most purchases? Which channels bring visitors that actually buy? How profitable are your sales? How much do visitors typically order? Combine It With: Use this data alongside data coming from your e-commerce hosting platform, like Shoppify or Magento. 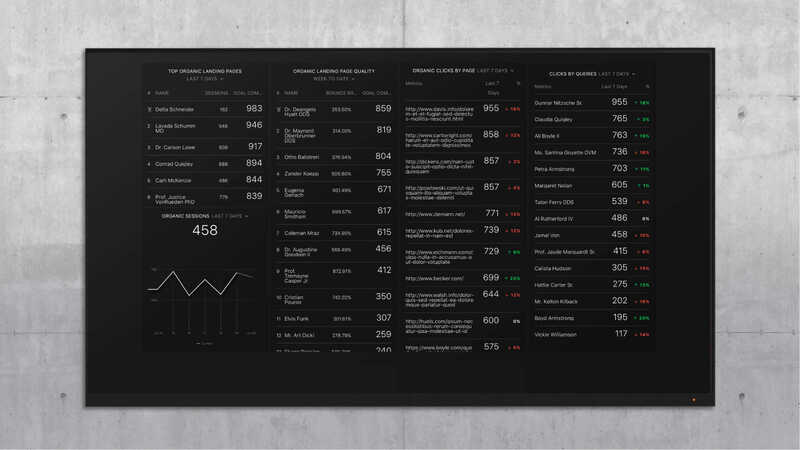 Problem It Solves: This dashboard looks at customer acquisition for ecommerce. It examines purchasing habits from mobile users and different referral sources. And, by looking at product revenue by product, it helps you understand where you need to offer more products. 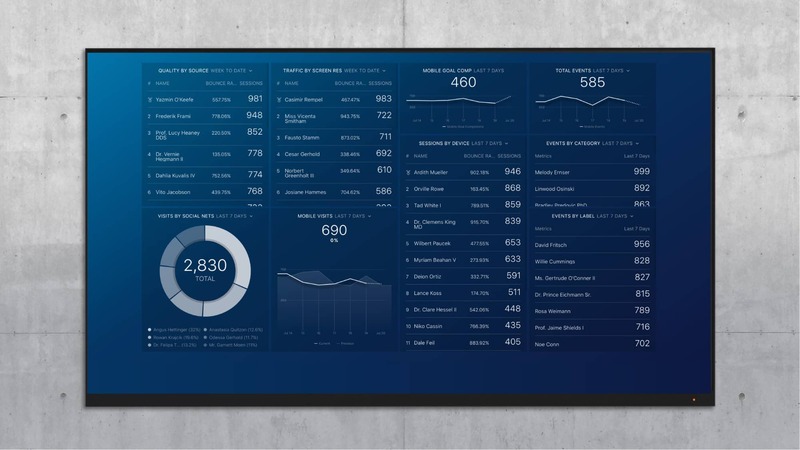 How To Use It: There are two parts two this dashboard: the tables, which show the top sources of revenue, and the line graphs which measure total revenue. Use the tables to double down on your most successful acquisition sources, and use the line graphs to monitor the health of your entire shop. Which devices are visitors buying on? Which referrals lead to purchases? How much product do visitors usually buy? How can I make each visit more profitable? Problem It Solves: Page load time is important for two reasons. First, it is a factor in page ranking. Google allocates a limited crawl budget for each domain. And if yours is slow, it will not be able to crawl as many pages. Second, a slow page load can create a painful user experience, especially on mobile. A 1 second delay in page response can result in a 7% reduction in conversions, according to Kissmetrics. You do not want your first impression with new users to be frustrating. How To Use It: Use this dashboard to ensure that your most popular pages load quickly. Also, look at every step in the page load process, from DNS lookup to server response to load. You may find that certain countries or browsers experience consistent issues, which can be a front-end issue or a server issue. This will tell you where to start. Combine It With: SEMrush. Use SEMrush data to look at crawlability for your domain and make sure that your internal link structure also makes it easy for Google to crawl your page. If you are looking for a guide to adjusting your marketing plan based on real-time data, check out this case study from Turnkey Office Space.